THAILAND : Nineteen people were killed and 20 hurt Tuesday when a double decker coach collided with a truck in central Thailand and burst into flames, authorities said. "Altogether there are 19 dead -- 18 died at the scene and another one died at the hospital," said an official from the national institute for emergency medicine in Bangkok, who asked not to be named. 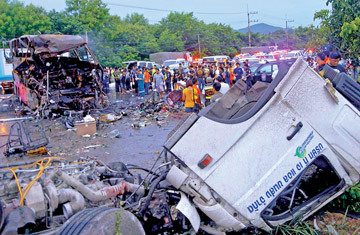 She added that 20 people were injured in the early morning crash in central Saraburi province. The inter-province bus, which was travelling from Bangkok to Roi Et in the northeast of the country, caught fire after the crash. Images from Thai television news showed the extent of the damage to the vehicle, which appeared to have been completely incinerated. Police, who have arrested the driver of the truck, said the crash was a head-on collision involving three vehicles. "The truck crossed from the opposite lane of traffic and hit the bus," said local police officer Lieutenant Colonel Assavathep Janthanari, adding that a pickup truck behind the bus had also been involved in the crash.